Kris Kobach Says He’ll Recuse Himself From Vote Count in Kansas GOP PrimaryHe reversed his position after a typo cut his tiny lead in half, but he suggested his opponent, incumbent governor Jeff Colyer, is being ridiculous. Primary Results: Kobach Holds Narrowest of Leads in KansasTwo races featuring candidates backed by Trump ended with a question mark on Tuesday. Expect recounts in Kansas and Ohio. The California Democrats Aren’t In DisarrayA lot of the angst over Democratic primary battles, and California’s Top Two system, may be excessive. An Early California Primary Could Change the 2020 Presidential RaceIt didn’t much benefit the Golden State when it tried an early 2008 primary, but in 2020 it could help prevent a huge presidential field. Trump Has Converted the GOP Base to His Ideology: Trump FirstA large swath of GOP voters now identify as “Trump Republicans” — and see loyalty to the president as the one litmus test for true conservatism. Conservatives Are Losing Their Base To TrumpThe voters Republicans were counting on to back them up in fights with the president have gone over to his side decisively and perhaps for good. A Roundup of N.Y. Primary-Election ResultsAdriano Espaillat won the Democratic primary for Rangel’s old seat, and more. Hillary Clinton Wins Washington D.C. PrimaryTheir first face-to-face meeting in months could be a turning point. Democrats Consider Opening, While GOP Closing, Primaries to IndependentsIt says a lot about both parties. If You Want a More Democratic Nominating Process, Take a Look at Caucuses FirstPrimaries are far more participatory. Disgruntled Sanders supporters, among others, should take notice. Democratic Establishment Candidates Win Two Key Senate PrimariesChris Van Hollen of Maryland and Katie McGinty of Pennsylvania keep things tidy for the Democratic Senate Campaign Committee. Clinton Draws Closer to Nomination With Net-Delegate Gains in the NortheastAfter the five northeastern primaries, Bernie Sanders’s hopes of a pledged-delegate majority depend on an implausibly big win in California. 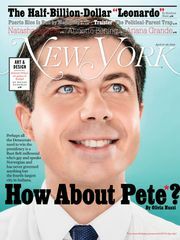 Today’s Northeastern Primaries: It’s All About Margins of Victory NowThis isn’t the Tuesday when the underdogs are likely to get much of a bite. Will Changes His Mind Mid-Column on GOP RulesSeems whatever it takes to make the GOP reflect the snooty conservative columnist’s preferences is all right with him. Where Sanders-Friendly Indies Can and Can’t VoteThe upcoming primaries will be mostly hostile to indies. And then there’s California, where many who think they are independent aren’t. National Parties Don’t Control Nominating RulesProposals to change them often ignore the roles of state parties, state legislatures, and even the opposing party. Hillary Clinton Sweeps Ohio, Illinois, and MissouriHer Missouri victory came down to a few thousand votes. Is Bernie Sanders Still Running to Win?The challenger needed to win three states or round up a passel of delegates. He didn’t. Here’s What the Early Exits Are Telling Us About This Week’s ‘Super Tuesday’ Bernie Sanders and Ted Cruz are performing well with late-deciders. On Semi-Super Saturday, Cruz Reversed Trump’s Momentum, Rubio Fell FlatThe GOP contest is looking more and more like a two-man race. Preview of March 5–6 Primaries and CaucusesFive Republican events will test Trump’s momentum after a stormy debate, while four Democratic events will test Sanders’s persistence. Why Bipartisanship Still Matters for CandidatesWe don’t pick our presidents based on their history of bipartisanship. But maybe we should. 35-Year-Old Iraq Veteran Unseats House Democrat in MassachusettsSeth Moulton beat Representative John Tierney. New Yorkers Have Mixed Feelings on Candidates Facing Federal IndictmentsPrimary voters were surprisingly forgiving. Andrew Cuomo, Running Mate Fend Off Primary Challenge From the LeftBut ignoring Teachout may have hurt him in the long run. What You Need to Know About Today’s New York PrimariesGet to know the candidates — or at least, who’s facing federal charges. Reactions to Eric Cantor’s Stunning Defeat, From Fear to GloatingBoehner made it sound like someone had died. Eric Cantor Loses to Tea Party Challenger in Huge Primary UpsetTo a tea party–backed college professor. Charles Hynes Out After 24 Years As Brooklyn D.A.He lost to Kenneth Thompson. Everything You Need to Know About New York City’s PrimariesHow to vote, who’s running, and which races to watch. Charlie Rangel SurvivedAdriano Espaillat will concede the race today. It Looks Like Charlie Rangel WonThe hand count is over, but victory has not officially been declared. Charlie Rangel’s Lead Continues to ShrinkIt’s down to 802 votes as of last night. State Supreme Court Agrees to Hearing on Charlie Rangel’s Primary WinIt’s still not clear whether it was, in fact, a win. New Yorkers Too Busy Enjoying Summer to Vote in PrimaryWho wants to participate in the electoral process when it’s nice outside? Charlie Rangel Survives Primary ChallengeThe embattled incumbent will run for a 22nd term. Hakeem Jeffries Wins Eighth District Democratic Primary [UPDATED]Jeffries wins and wins big. Will Anyone in New York Go Out and Vote Today?The congressional primaries are being held much earlier this year.